Artificial grass is perfect for busy families with children due to its superior qualities. It is low maintenance, highly durable and soft under foot. As artificial grass has been developed from astro turf commonly used in sports arenas it will put up with the heavy duty use of a busy family without affecting its quality. Artificial grass is simple to maintain and if properly looked after, can last you for years. No more mowing, no more weeding and no more watering all you need to do is brush your grass pile back up to maintain a healthy fresh look year round. 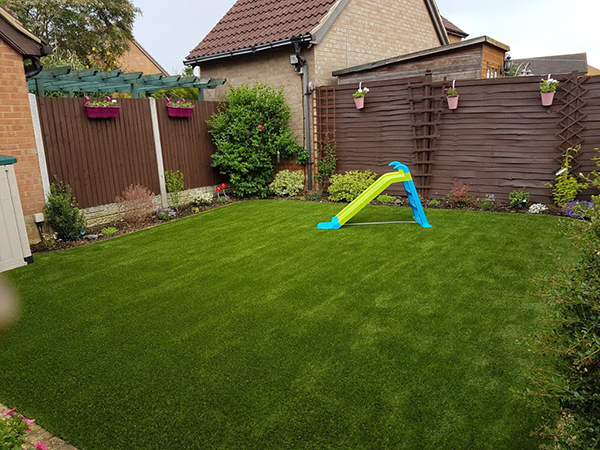 All of our artificial grass solutions are safe, contain no nasty surprises and use the best materials available meaning your children can explore the garden in safety. When we secure your grass we use no sharp fixings, giving you peace of mind when your children are bare foot outdoors. Any mess or spillages from children playing outside can be easily removed from artificial grass by simply hosing it down, ensuring a safe and sanitary place for your family to enjoy their time. On top of this, our artificial grass is fully recyclable meaning it is good for the environment. For artificial grass that puts your family first, contact us today! Artificial grass has a whole host of benefits, which are great for busy families with children and pets! If you require artificial grass, landscaping or paving contact us today!